At this year’s Hydro Connect festival, beatbox maestro Beardyman was one of those relatively unknown artists who strolls straight out of leftfield and has the whole crowd talking about him afterwards. Yet 26-year-old Brightonian Darren Foreman has previous. Here’s how he got to be where he’s at in five easy steps.. Attending the University of Sussex, Foreman found inspiration for his future career out-of-hours, specifically when he attended a Rahzel set with his friends. Within a year, he was trying out beatboxing himself on stage. He called himself Beardyman because, er, he had a beard. 2. When Will I Be Famous? Yes indeed, the hideous BBC One talent show on Saturday nights, rather than the hideous Bros track from last century. Foreman was on the show way back at the start of its run in early 2007, but unfortunately came second in his heat. Or maybe fortunately – introducing hip hop to Middle England is one thing, becoming a painful cause celebre because of it quite another. He’s still a bit of an oddball minor celebrity, though – witness his turning up on, for example, Lily Allen and Friends earlier this year for a bit of a ‘turn’. That’s more like it! Foreman won the ’06 title and then made history when he became the first person to retain it the next year. He’s also won the Lyric Pad Beatbox Battle twice, the title of London Beatbox Champion, and competed at international level. Not that he was ever without it for such singular skills, but his earlier adventures in TV land have given way to well-received support slots with Groove Armada, Andy C, Grooverider, Sly and the Family Stone and Chas ‘n’ Dave (yes, really), appearances at Bestival and Fatboy Slim’s Big Beat Boutique, and his own Battlejam night in Brighton. He is, surely, the face (and mouth) of UK beatboxing at the moment. 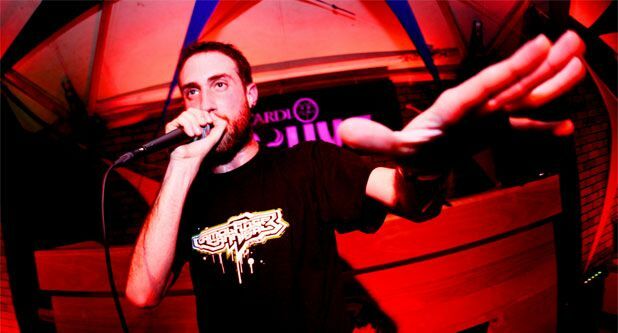 Beardyman plays King Tut’s, Glasgow, Sun 14 Dec.